It’s quite smooth-running and modern-looking, with a clear-cut and well-organized layout. Just like other PDF suites, the main window encompasses all the features, without making use of ribbon-toolbars or other menus of this sort. 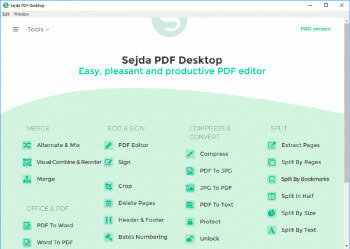 The app’s tools are neatly grouped into four main, self-explanatory sections, SPLIT, MERGE, OFFICE & PDF, and EDIT & CONVERT. In addition, you can add headers and footers, protect your PDFs, as well as quickly extract texts. It goes without saying that each tool has its bespoke menu and extra-little-options that allow you to thoroughly and accurately process your PDF according to your needs. Last but not least, within the General Settings section, easily accessible from the hamburger-like drop-down menu (upper left side), you can select the output folder for your processed PDFs, as well as choose from a small list of overwrite-related scenarios. Merge files into one PDF. Visually combine and reorder pages, merge multiple PDF files. Alternate and mix odd and even page files. Split documents by pages. Extract separate documents. Split by size, bookmarks or text occurrences. Divide two page layout scans. Convert PDF files to Office and image formats. Convert PDF files to Word, Excel and to image. Convert images to PDF file. Reduce the size of PDF files. Optimize images and resources. Apply PDF passwords and permissions. Add copy and edit protection to a PDF. Include a password to protect your PDF from unapproved access. Add image or text watermark to PDF documents. Convert PDF text and images to grayscale. Trim PDF margins, adjust visible page area, change PDF page size.